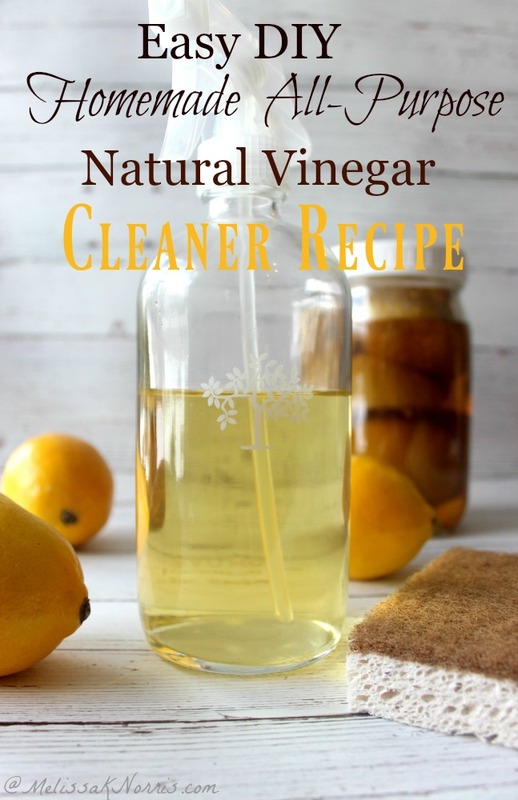 Homemade natural vinegar cleaner recipes, especially easy homemade DIY ones, are my favorite. Who doesn’t want a cleaner that can be made from items you eat, can grow on your own land, and the best part, that actually work? Your hand better be raised high my friend. This is my favorite all-purpose homemade cleaner, and by all-purpose, I mean all-purpose. You can use this on your counter tops, sinks, windows, the floor, mirrors, pretty much anywhere in the house. Update: We put in wood floors this past December and I can now add cleaning wood floors with vinegar to this list of things this recipe does! I should clarify, cleaning laminate floors with vinegar but we also have a wood butcher block counter that I use this on too… so in other woods, pretty much every surface of my house. Is there anything more cool than using what you’d normally throw out to create something you’d normally be buying in the store? On my homesteading list that’s pretty awesome. Heck, you could even use it as a marinade or salad dressing if you wanted to. After having chemical burns on my skin as a teenager using store bought cleaners, it’s super important to me to only be using natural cleaners in my home. I don’t want my kids or myself exposed to anymore chemicals than necessary. I mean, have you read the warnings on those bottles? Yikes. But I still want a clean home, enter the natural vinegar cleaner. I’ve been using this homemade cleaner for over five years and will never go back. Many people use vinegar to clean with all by itself. Which is fine, the scent of the vinegar leaves once it dries. But using citrus peels gives you the cleaning power of citrus oils, which helps cut through grease, and definitely smells better. Not only that, but you’re using peels, something you’d normally be tossing out, and my frugal homesteading heart adores that. And this version lets you use your Mason jars… I have an addiction to Mason jars, just in case you didn’t know. Gather your citrus peels. Lemon, orange and lime all work great. You could try grapefruit, though I haven’t. Get your vitamin C in by eating your citrus and then we’re going to put those peels to work my friend. Take a wide-mouthed Mason jar (one of my favorite things in the whole wide world) and place your peels in the jar. Pour vinegar (you can use white or apple cider, I use the cheaper white when it comes to cleaners, but if you want an all homemade version check out How to Make Homemade Raw Apple Cider Vinegar here) over all of your citrus peels, make sure they’re completely covered. Slap a lid on that bad boy and put it in a dark cool cupboard. If you remember to shake it every few days, that’s cool, but if you forget, no big deal. Let it sit so the citrus oils can infuse the vinegar for up to 6 months. You can strain it in as little as 4 weeks, but the jar I forgot in the back of the pantry by accident and discovered it 6 months later was the best batch I ever had. You literally couldn’t smell any of the vinegar, just the luscious citrus scent remained. Tip: Let your citrus vinegar infuse for at least 8 weeks, longer if possible. Strain your citrus vinegar out into a glass container. Pour into a glass container. Mix your citrus vinegar with 2 parts water (Vinegar to water ratio for cleaning I use for a stronger cleaner is 1 part water to 1 part vinegar) in a glass spray bottle. Toss out all your old cleaners as this will quickly become your favorite and no worries if the kiddos or pets get into it, holler! My favorite spray bottle is this glass spray bottle by Grove Collaborative. I use it with the natural vinegar cleaner. I personally prefer using glass whenever possible, especially with acidic cleaners and items. Plastic can break down over time and I for one don’t want it’s chemicals leaching into the natural cleaner I made to spray down our home and counter tops with. Remember, this offer soon grab your free spring set now! The Mrs. Meyers soaps come in two limited edition spring scents, peony and lilac. Thanks to the blend of essential oils and plant-derived ingredients, they don’t smell artificial — just light and pretty. Fill up your glass spray bottle with our Natural Vinegar Cleaner Recipe above and never purchase cleaner from the store again! I plan on trying a lemon and lime peel mixture next, how about you? Try these 17 Spring Cleaning Hacks with Homemade Cleaners for every room in the house. Place citrus peels in glass jar and cover with vinegar. Make sure the peels are completely submerged beneath the vinegar. Place a lid on and set it in a dark cool cupboard. Let the citrus infuse the vinegar for 6 weeks to 6 months. Strain out the citrus vinegar. Mix the vinegar with equal parts water for a strong cleaner or dilute with 1 part vinegar to 2 parts water for a great natural all-purpose cleaner.